What kind of technology do you use in your day to day life? Think about it… How much do you rely on your mobile phone? How much do you use a desktop, laptop or tablet? Do you wear a smartwatch proudly on your wrist? Do you need to use these for work? To catch up love ones on the latest family scandal? Or tell your friends some juicy gossip? Maybe you use it for entertainment on the toilet? Hey, there’s no judgment here. But seriously… it is undeniable that technological advancements over the last 30 years have transformed the world we live in. From advancements in science, medicine, communication, trade, transport… the list goes on and on. Technology has redefined efficiency, effectiveness, and productivity. It touches every part of our lives. However, this change has led to an increased demand for new tech-savvy skills in the workforce. Inevitably, it was only a matter of time before the integration of technology in school education altered from an option to a necessity. Gone are the days of just boring blackboards, tedious textbooks, and the practiced pencil on paper. Today, students need to be digital natives. In Queensland, schools have an average student-computer ratio of 1:1– that is one computer per student! 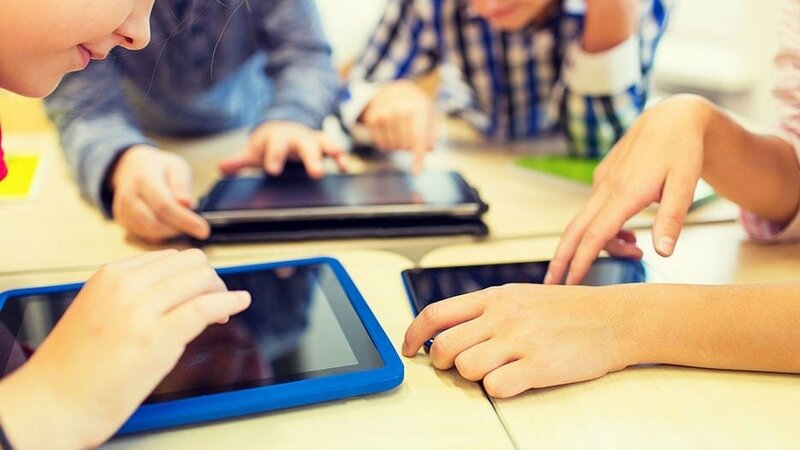 Either through Government funded ‘Take Home Programs’ or the ‘Student Bring Your Own Device Policy’ (BYOD), various forms of technology have become a fundamental tool in mainstream education. But like any monumental shift in history… the use of technology in education has not gone uncriticised. Parents have been left outraged, at the additional cost of computers. A minority of teachers were reluctant to integrate technology into their teaching strategy. Health experts have also raised concerns that kids are glued to screens, resulting in poor physical and mental health. Yes, as with everything, even technology has its cons. But like chocolate, it is good for you in moderation! If used properly, technology has significant benefits on education. Let’s face it… we’re not all like Hermione Granger and love to spend our time in the library. As of 2018, there are approximately 1.94 billion websites on the internet. This provides access to international research reports, information and theoretical articles that would otherwise be limited or even unattainable. But why are international sources so valuable? How does this benefit students? Despite its great potential, it must be acknowledged that the research process can be overwhelming if you don’t know how and what to look for. Students can waste time scrolling through source after source trying to look for that one piece of information to perfect their assignment. These simple tips provide the key foundations for effective research. This can be utilised in all future career endeavours and will last a lifetime. PHOTO FOR HERE URL DOESNT WORK? 1 teacher per 25 students. The odds are not in anyone’s favour. I remember like it was yesterday, sitting in Math class confused, frustrated and overwhelmed by the content. I would pop up my hand to ask for help. But by that time there would already be a queue of students also in desperate need of assistance. Then when the teacher finally did get to me, they only ever had a few minutes spare. One-on-one teaching is limited, if not impossible in classrooms. Teachers simply do not have the time or resources to fairly distribute this kind of support to students. Student’s access to help at home may also be limited, as parents may not have the time, capability or knowledge to provide students with the support they need. As a result, students are left struggling. Luckily, due to technology learning just became a thousand times easier. Now while these tools are a real game changer, sometimes there’s nothing like a friendly face. At A Team Tuition, we have a range of skilled, friendly and affordable APTs to provide that much needed one-on-one learning experience. They have the time and resources to work with students to achieve comprehensibility. Remember, it is important to never give up! Demand to understand! What do you think about this cartoon? Is it fair that all the animals are tested the same way, despite their differences? Does the fish have the same capability as the monkey to climb the tree? Well of course not. This is a very powerful visual representation of the challenges faced by the education system. It is difficult to meet every student’s independent needs. As a result, many children struggle, grow frustrated and fall behind with their school work. But if this sounds like a student you know, don’t stress! The answer may be right under your nose…. Or on this page. The issue is that students have different abilities and learning styles. Put simply, a learning style is the most effective method in which a person understands and retains information. Researchers have categorised these styles into three main categories: visual, auditory and Kinaesthetic. At A Team Tuition, our APTs use a carefully designed, engaging test to determine each student’s learning style. This helps our APTs individualise and accustom each session to student’s specific needs. This approach allows students to achieve maximum comprehensibility, information retention, and productivity. Ok great, we have identified the different learning styles… but how do we use this information to help students learn? The answer… technology! Visual learners with a wide range of access to images, videos, graphs, diagrams, tables, vision board templates, and other displays. Auditory learners with an unlimited database of audio recordings, music, and speeches. Kinaesthetic learners with a diverse range of apps and software that feature interactive touch games. It is undeniable that technology has revolutionised the way we can adapt and apply different learning methods in education. So, it doesn’t matter what type of animal you are… everyone can be on an equal playing field. Today, babies are born into a digital world. From the moment they open their eyes, they see their parent’s using touch-screen mobile phones, no doubt eager to share pictures of their new bundle of joy with the world. Depending on their lottery of birth, they may even have older siblings to watch play on their laptops and tablets. Then before they can walk and talk, they will be interacting with touch screen devices, as a means of distraction. Technology will be everywhere they go. So, what effect does this have on kids? Research has proven that the experiences we have over the first few years of life significantly shape cognitive development. Kids are literally being wired from infancy to interact and engage with technology, as a primary learning tool. So, it is no surprise that kids are more excited and drawn to these interactional digital forums, than archaic methods. And who can blame them? A bright, colourful screen is much more exciting than a boring book, right? Not to mention… it’s super easy! Today, phones are small, portable and have a wide range of apps that feature fun children’s games for all ages. There is something for everyone, whether it is about animals, characters from the latest tv hit or puzzles! Technology makes a fun learning tool. “At the heart of effective technological integration, technology offers opportunities to be more actively involved in the learning experience”. It is only logical that we continue this throughout their future studies. If it works… and it does, why change it? Technology is a key, effective tool to foster engagement, attention, learning independence and increase productivity. No one is saying that technology is perfect. Like anything, it can be used incorrectly. But there is no doubt that the effective integration of technology can have extreme benefits. At A Team Tuition, our APTs strive to inspire students to enjoy, engage and positively interact with learning. APTs know how and when technology can be used to maximise the learning experience. This has visible positive effects on student’s growth mindsets, attitudes to learning and of course… their academic achievements. Whilst this is a big statement to make… it is true. These days businesses include some form of digital adaptation. Whether businesses sell technology, utilise technology internally as a customer service device or have implemented it as a key foundation for management, advertisement, and sales. The economy would look very different without it. But with this exponential integration of technology… comes the requirement of new skills. Within the next 2-5 years, over 90% of Australia’s workforce will require competent technological skills. What else… it is almost inevitable that even the jobs that are not automated yet, will be in the near future to meet economic demands. This means that 60% of students in Australia are currently studying for jobs that will be automated when they finally open the door into the real world. However, while these basic skills may not directly translate into the workforce, it does teach student’s core concepts and increases their adaptability to technology. A Team Tuition is a business that welcomes and utilises the opportunities technology provides. We understand and appreciate the importance of teaching students the core technological skills. Our APTs are not just interested in the marks on our student’s report cards, we want to set them up for life long success! APTs help build adaptability, resilience and encourage a strong, growth mindset so that students will be able to grasp any great employment opportunity in the future. In a world that is governed by technology, we cannot stop children from eventually finding an online presence. Whether through social media, interactive games or school forums, they will gain access. Now while we have established that technology has monumental benefits, we must acknowledge the risk that comes with it. There are dark and dangerous aspects of the web. Bullying, privacy infringements and online predators are real threats. They must be taken seriously. We need to be proactive! We need to teach kids how to be responsible online. Knowledge is power. One of the most significant, important and fundamental benefits of integrating technology into education, is that we can teach our kids to be safe. A Team Tuition’s APTs purposely build rapport, trust, and communication with students in tutorial sessions to provide a safe environment to talk about these issues. APTs understand that the safety of our students is of the highest priority. If issues of online caution arise, parents will be notified immediately. Whether we like it or not… technology is everywhere. It is in our homes, at work, and in our schools. Technology in education is not a choice, it is a ‘necessity’. The benefits of technology in education are just too great. Students can access a wide range of resources, get assistance on demand, connect with learning material no matter their learning style and engage with their work. Not to mention it will prepare students for the workforce and aid in teaching online caution… that will help to keep them safe. It is our job, as parents, teachers, and APTs to use this technology to our advantage and help shape the bright minds of tomorrow.